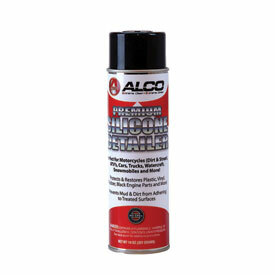 Alco Premium Silicone Detailer 14 oz. Alco Silicone Detailer is an advanced silicone product that not only protects, but safely restores the shine to plastic, vinyl, rubber, black engine parts and more! This pleasantly scented formula has been developed without any ozone depleters or chlorinated solvents. It is long lasting, leaves a show room shine and helps make future clean-ups easier. Perfect for Motorcycles (Dirt and Street) ATV's, Cars, Trucks, Watercraft, Snowmobiles and More! When racing XC, you will encounter mud. I spray this on my fenders, top of my helmet, and other areas where you don't want mud. Just be careful not to spray anything you want to stick to like grips, seat, brakes, etc. This keeps some of the mud from sticking as well as makes the clean up process a bit easier. Doesn’t last forever but looks good while it’s on. It will leave a nice smell in the garage too. Lipstick on a pig - this stuff is great! I've had a few bikes that were "rough around the edges" and also have some new bikes. Regardless of age, this stuff is a miracle worker. It will make a rough, faded plastic bike look like new (obviously, extreme cases do not apply). And for the new bikes, it keeps that beautiful shine and also helps the mud and debris wash off easier. I will never again be without a can of this in my garage! This silicone detailer is safe to use on every part of your machine, and there is nothing that it won't make look like new! Excellent product for anyone wanting a nice looking ride, and something that will protect and keep it nice looking for a long time. This stuff is awesome! I washed my bike & then used this product & I couldn't believe the difference it made. My bike is 10 years old & after wiping it down with this product it made it look like new again. My plastics were dull & this made the color look better & brought back the shine. It also made my faded seat color look great again as well. I would definitely recommend this product. Really helps shine the bike up, and makes the next cleaning easier. Better than the leading brand out there,not greasy and hydrates the plastics and rubber. Like most bikers we never get to clean our bike like we wish we could, cleaning means not riding but I do break down on occasions and detail it like it deserves. I have always used S100 to make my engine look new and we all know itâ? ?s very pricey. Luckily I tried Alco Cleaners Detail Spray and was very impressed with it. I could not tell any difference in its performance and S100 but the Alco Cleaners was much better priced for the size. If you are a S100 user I highly recommend trying Alco Cleaners detailer spray along with the rest of their products. Makes your bike pretty again. Another great product from ALCO, after you get done washing your dirt bike with ALCO Cleaner. Make it shine like new with this product. Makes my black wheels on my KTM pop, hides all the scracthes in my graphics and it smells pretty good too. BEST ANSWER: NO this is basically a silicone spray detailer. Surface will need to be cleaned and the post finish with this product. I use this product after every wash. Makes bike look fantastic. I've used this product liberally on my dirt and street bikes with no noticeable effects on any decals. Won't hurt decals. This stuff not only makes all your plastic look great, it smells good! No it does not harm decals. Great product I even use it on my vehicles.